Technology magazine IEEE Spectrum has launched its first iPad App “Robots” featuring 126 robots from 19 countries. 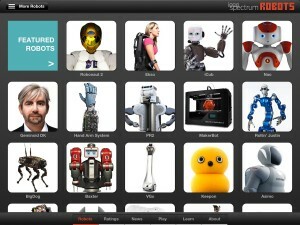 The app includes technical data, interactive images, a robotic timeline and glossary. Robots can be viewed in 360 degree views and searched by type, country, date and size. The app is updated daily with news from the Automaton Blog, and it even includes advice on getting started in robotics, with audio contributions from leading roboticists like Rodney Brooks and Colin Angle.